New from Videalert, a UK supplier of traffic enforcement and management products, are mobile ANPR cameras. Designed for use with Videalert's multi-purpose Mobile Enforcement Vehicles (MEV), including cars and motorcycles, the HD camera will deliver enhanced capture rates and increase productivity in parking and traffic management applications, the firm says. The new 2 megapixel camera is ONVIF compliant and uses Sony DSP for noise reduction and infrared sensitivity to accurately capture crisp images of reflective number plates at distances of up to 40 metres. It also features a full colour overview module to capture contextual images of vehicles in daylight and challenging light conditions. 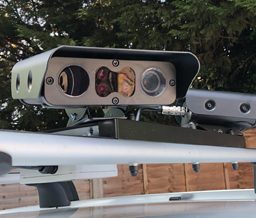 Tim Daniels, Sales and Marketing Director of Videalert says: "We are now fitting this innovative new camera technology to all our new MEV platforms as it will deliver number plate read rates of over 98pc in a wide range of applications with vehicles being driven at normal speeds. Our MEV engineering hub facility in Trowbridge, Wiltshire enables us to build and test multiple platforms concurrently and deliver in greater volume to meet the requirements of fleet operators for single or multiple vehicles."